There are many ways that you can support the Irish Horse Welfare Trust and help us to rescue horses & ponies in need of our help. The IHWT is funded almost entirely through public donations. You can make a real difference by organising your own fundraising event. 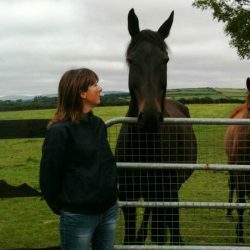 If you are a horse owner or a horse lover who wants to help the IHWT and get involved, why not organise a fundraiser for the charity and help horses in need. Anything from a Pub Quiz, Raffle, Sponsored Walk or Ride Out, Book Sale to a Cake Sale . This Fundraising Policy is in compliance with the Statement of Guiding Principles for Fundraising which was drawn up for the Irish Charities sector in the context of the Charities Act (2009). The Charities Act has the stated objective of “ … implementing agreed Codes of Good Practice in relation to the actual fund-raising operations …”. The Statement sets out best practice for charities who fundraise from the public, based around core principles of respect, honesty and openness. The IHWT considers the Statement of Guiding Principles for Fundraising when planning all fundraising activity. The IHWT provides honest, open and transparent disclosure when fundraising from the public. The IHWT ensures that fundraising staff/volunteers are provided with information and training, when needed, on the Statement of Guiding Principles for Fundraising and its implementation. The IHWT ensures that all donations are tracked and recorded and complies with data protection requirements. The IHWT is accessible to the public through a number of readily available contact options. As a charity seeking donations from the public we the IHWT, aim to comply with the Statement of Guiding Principles for Fundraising. Our pledge is to treat all our donors with respect, honesty and openness. We commit to being accountable and transparent so that donors and prospective donors can have full confidence in IHWT. We promise we will effectively apply your gifts to us for their intended purposes. Be informed of the organisation’s mission, and of the way the organisation intends to use donated resources. Be informed of the identity of those serving on the organisation’s governing board, and that the board will exercise prudent judgement in its stewardship responsibilities. Be assured your gifts will be used for the purposes for which they were given and promptly receipted. Receive appropriate acknowledgement and recognition. Be assured that information about your donation is handled with respect and with confidentiality to the extent provided by law. Expect that all relationships with individuals representing the charity will be dealt with professionally. Be informed whether those seeking donations are volunteers, employees of the organisation or hired third party agents. Have easily available the agreed procedures for making and responding to complaints. Have the opportunity for any names to be deleted from mailing lists. IHWT mailing lists are not shared with third parties. If you do have a comment about any aspect of our work, you can contact IHWT in writing or by telephone or email. In the first instance, your comment will be dealt with by our Director/CEO. Please give us as much information as possible and let us know how you would like us to respond, providing relevant contact details. Fundraisers and fundraising charities, such as the IHWT, commit themselves to the highest standards of good practice and to ensuring that all their fundraising activities are respectful, honest, open and legal. Any information obtained in confidence as part of the fundraising process must not be disclosed without express prior consent. Comply with the ICTR good practice factsheet on handling cash and non-cash donations. Be generally responsible to explain to the public how fundraising is organised and to help educate the public about the realities of resourcing charitable organisations. Where specific questions are received these should be answered openly and honestly. The principle of informing the charity in advance and adhering to these standards will be highlighted as much as possible by the organisation. Cash handling procedures are important to protect the organisation from fraud, theft or embezzlement, to protect staff or volunteers from accusations of dishonesty and to assure donors that their donations and gifts are used for the purpose for which they were given. Cash received is to be collected, counted and recorded by two individuals. Cash is counted in a secure environment and held in a secure place until it is possible to bank it. Income summaries ought to be made at the point of counting for reconciliation with banking details at a later stage. Deductions must not be made from cash received. Expenses must be met (where previously agreed) by the charity after receipt of the cash. A receipt is given to the donor recording the amount of the donation, the donors details, the source of the donation and the purpose for which the donation is being made (if relevant). All cash handlers must have suitable banking bags for counting and bagging up the money. Wherever possible, cash is banked immediately. Counterfoils are retained for the charity and the individual responsible for banking is required to submit these to the office. Cash never left unattended or in an unattended environment. At the earliest possible date reconciliation is made between cash banked and income summaries. Where practical, this is undertaken by a person other than those involved in the counting and cashing up of the money. Reconciliation sheet is provided to the office of all income received to correspond with receipts. Endeavour to sell any tickets prior to an event to reduce the need for cash collection on the day of an event. Make pricing of tickets or goods for sale sensible (for example, 50 cent, €1,€10, €100 etc) in order to minimise cash handling. All tickets for sale are pre-numbered and sales and takings reconciled. Nominate one individual with overall responsibility for overseeing cash handling. Issue round quantities of tickets or programmes with sellers signing for the quantity received. Unsold tickets or programmes are returned and reconciled with the record of cash received from each seller. Discrepancies should be investigated without delay. Collections are recorded on a summary with a signature from the sellers/organiser signifying the amount of cash collected corresponding to the receipting records. All final amounts including floats are collected and recorded from all locations at the end of an event. Donors are encouraged to make donations by cheque made payable to the charity or by credit card where practical rather than cash. Every Donation is receipted on an official receipt system. Donors are encouraged never to make a cheque payable to a named individual. Donors should be discouraged from sending cash donations through the post. Ensure that it is clear that donations must be sent to the charity’s offices rather than to the fundraiser’s home or business. Anyone considering fundraising on behalf of IHWT should let the charity know in advance as the charity will be able to provide support and assistance. It is the responsibility of the event organiser to ensure that they have the appropriate insurance cover for their event. Where a donor has conducted a fundraising event without prior notification to the charity, they should be informed of the value of informing the charity in advance for any future activities. All PR must be approved by the IHWT in advance. Volunteer cash handlers are given clear instructions from which to work. All volunteer cash handlers have appropriate documentation from the charity authorising them to handle cash (such as an ID card, letter of authorisation). Where children are collecting money (for example, sponsored swims, bag-packing etc.) they must be accompanied at all times by an adult, and the relevant documentation (sponsorship cards) in regard to pledged monies should be available for inspection by the sponsors. It is illegal for children under 14 years to take part in cash collections (Street and House to House Collections Act 1962 as amended). IHWT is very grateful to those that undertake fundraising to support our work. Please contact our office for any help or support that you might need.